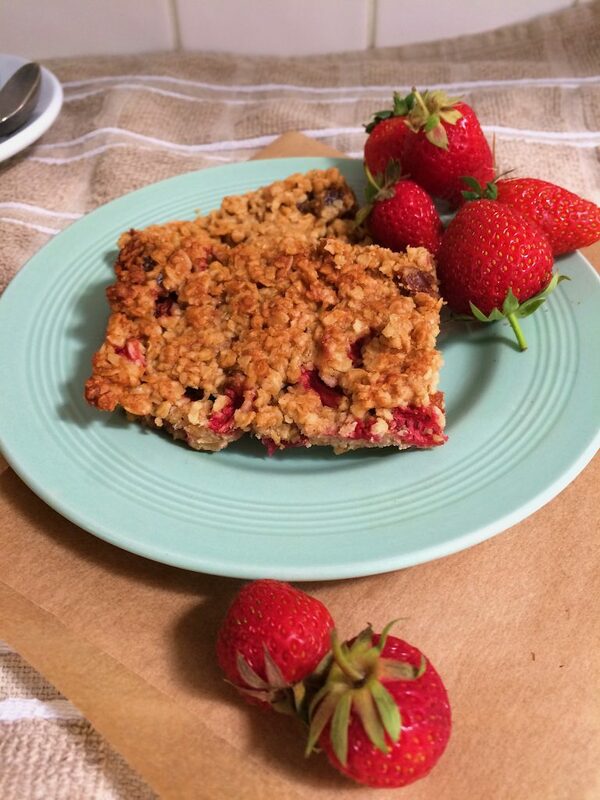 My allotment is really coming alive lately, so to use up my glut of berries here is my tried & tested strawberry & peanut butter flapjack recipe. A match made in heaven. Seasonal eating is something that I am passionate about. It is one of the best things I have learnt from growing my own produce. Over the years I have become familiar with what crops will ripen and when. 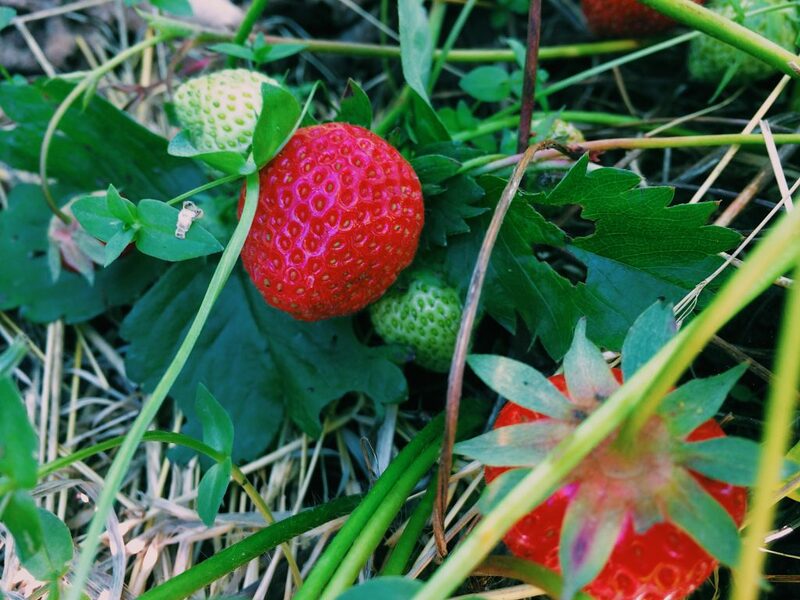 So now that the sun has started warming our bones the strawberries are out. It’s a no brainer that this is the best time of year to eat them. You just try to find strawberries in the winter, they’re practically anaemic. For top flavour it pays off to follow the seasons. 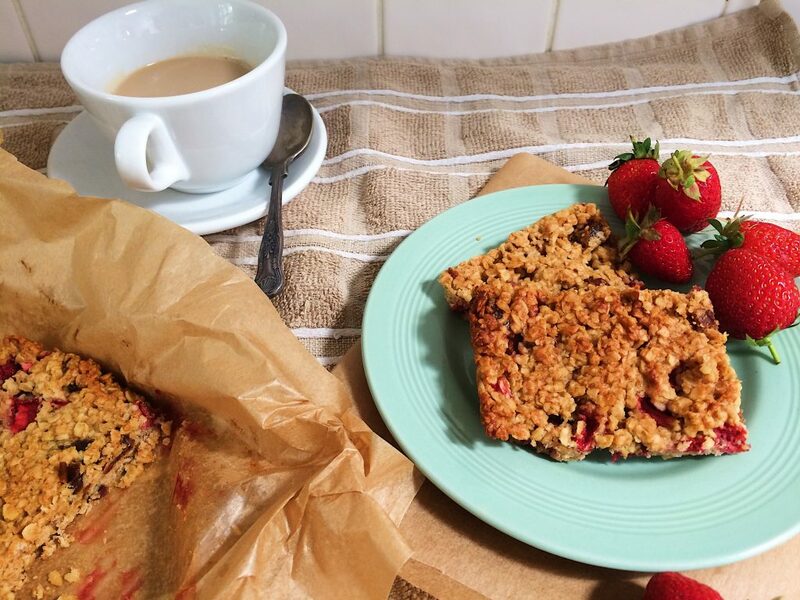 I only ever make these flapjacks when my strawberry patch is producing more than I can manage (which is like, every year). I have so many to use up that I simply can’t get through them all otherwise! There is something about a homegrown strawberry that is just that little bit nicer than shop bought. For one the taste is far more intense. What’s more is that they pair perfectly with a big dollop of peanut butter in this recipe. These flapjacks are rustic, to say the least. They taste divine when warm & fresh out of the oven. 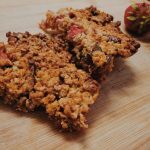 Beware, though, they are mega crumbly, so with this in mind you might want to put them in the fridge before you slice them up as it helps keep them from turning into granola! 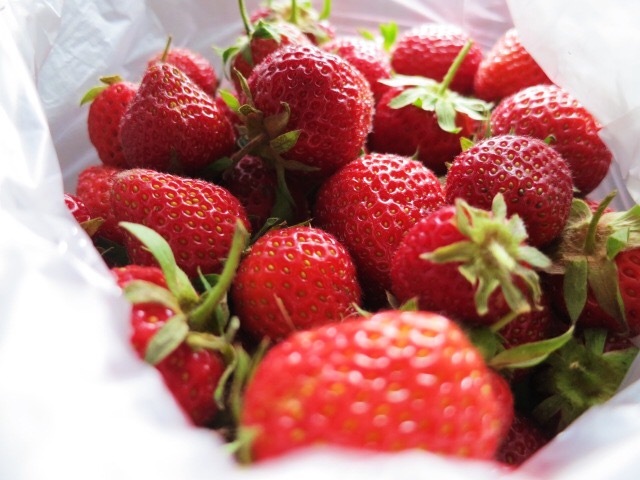 Make sure you fold in the strawberries gently to stop them breaking up. Also, to add that extra bit of texture and sweetness I cut up medjool dates and add them to the mix. However, you can jazz this up with other additions if you prefer. Raisins or chocolate chips would work really well too. As I write this post up I am finishing one of these bad boys off with a cup of coffee, perfect. 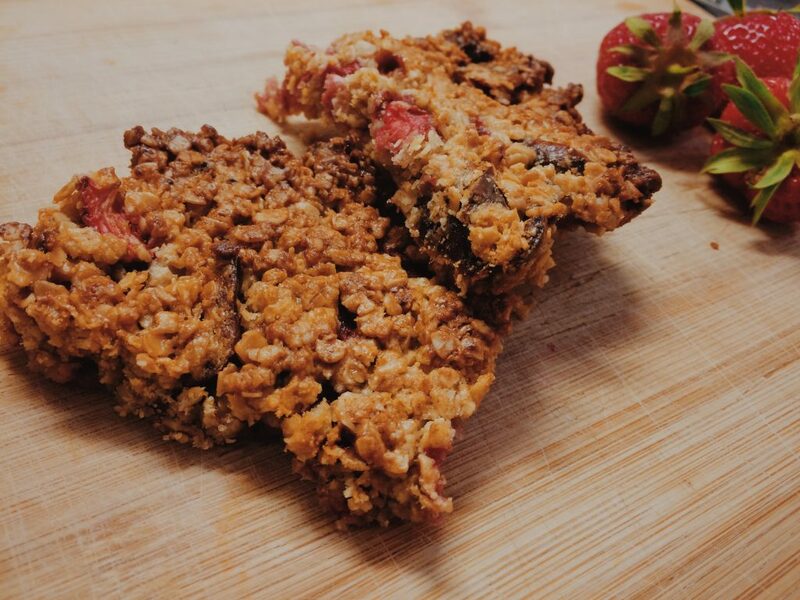 Delicious rustic flapjacks, dotted with fresh strawberries and medjool dates. Set you oven to 180 degrees. Line a baking tray with non stick parchment paper. In a pan, add the butter, peanut butter, honey & maple syrup. Heat on medium-low for a few minutes, stirring occasionally, until the butter is melted and the mixture is combined. In a bowl, combine the oats together with the dates and butter mixture. Once combined, stir in the strawberry chunks gently. Tip the mixture into the baking tray, smoothing out into the edges. Cook on the middle shelf of the oven for 20-25 minutes. They are ready once the top begins to turn a golden brown. Leave to cool in the tray. These flapjacks are crumbly, so would benefit from being cooled in a fridge before slicing. Also great warm if you don't mind the mess!